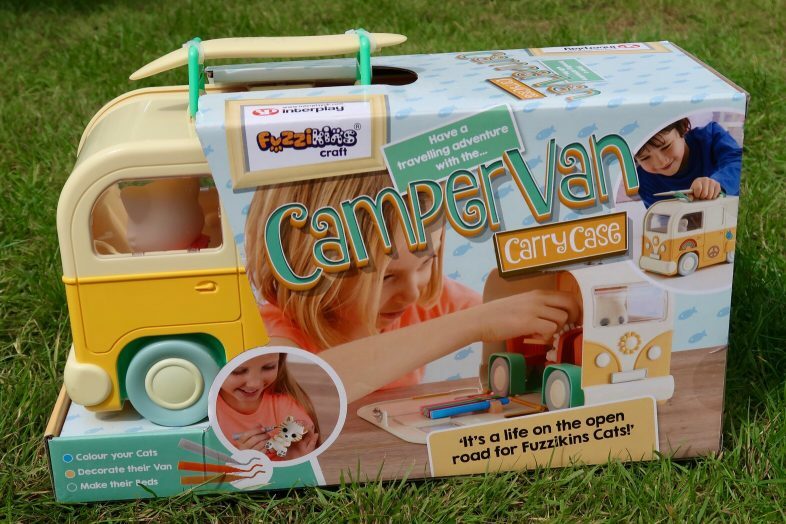 Manufacturer’s Description: Fuzzikin Cats love life on the open road and like nothing better than to drive their cool Campervan to the beach and party! 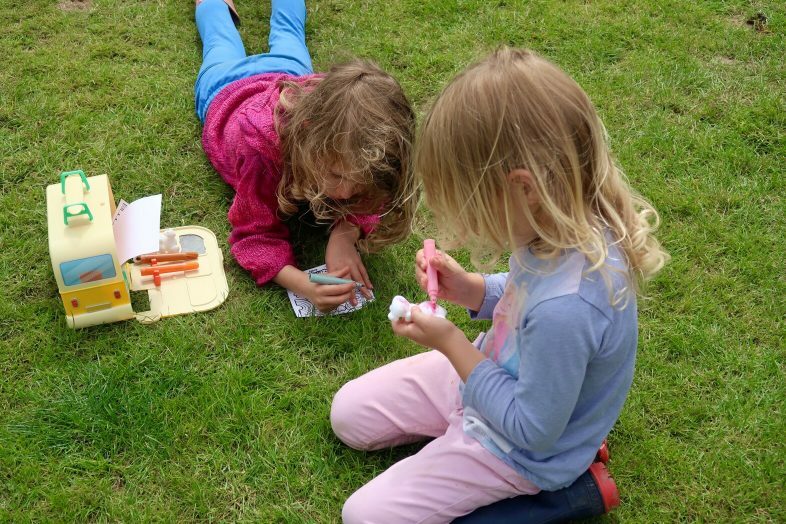 Kids can colour their cats and customise the van with the colouring pens and stickers provided. 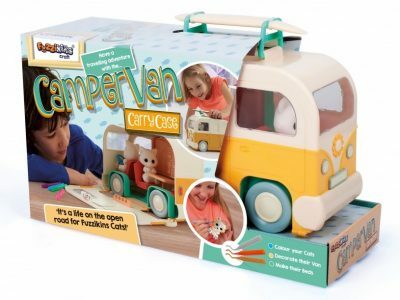 Review: This cool campervan toy has been a big success with both Georgie and Lydia, and it’s not hard to see why. Its a perfect mix of crafting, imaginative play, and cuteness. 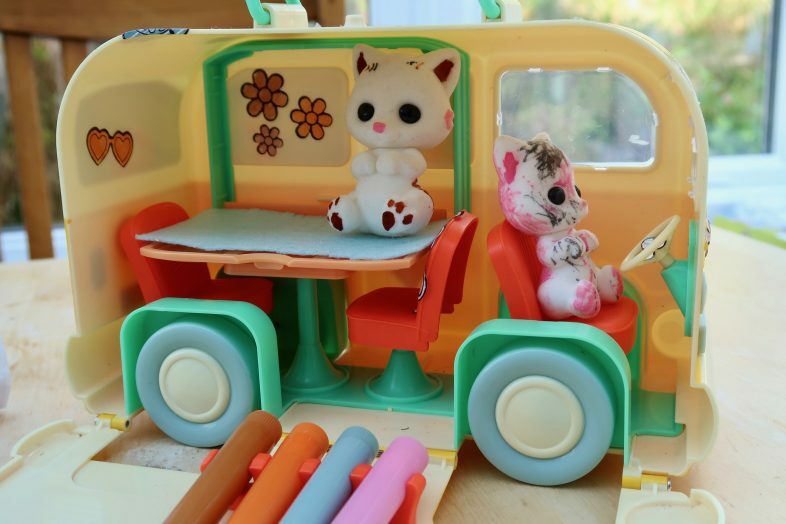 Who can resist tiny cats that you can colour however you like, and that travel around in a super cool campervan?! Not me. 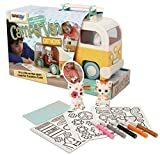 Inside the box, you get the campervan, two Fuzzikins cat figures, a felt blanket, 4 felt tip pens, 3 sheets of stickers, and a set of instructions. One of the cats is slightly bigger than the other, and they are both really cute – pure white, with black eyes. 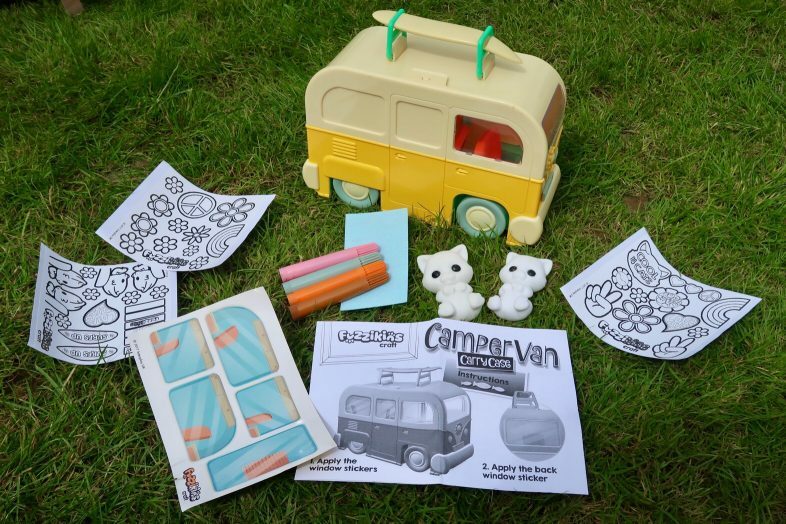 With the four felt tips (pink, grey, orange & brown), you can colour in the cats and stickers to completely customise the campervan and it’s occupants. Inside the van they have a table with two seats, and a fold down bed that they can share, snuggling up under their blanket for the night. A drivers chair sits at the front of the van, and the handle on top unclips to become a surfboard. 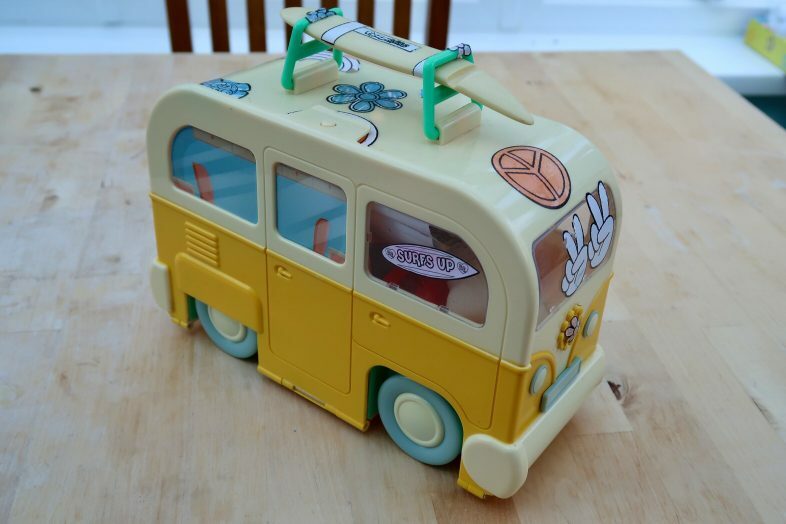 The side of the campervan folds down so that you can play with the kitties inside the van, and there are clips on the inside of the folding down part, which allow you to safely store the pens away when you have finished playing. The sticker sheets are also small enough to be stored inside the campervan, so you can easily pack everything away inside for easy transportation. The girls both had a great time colouring in the stickers and decorating the van inside & out to their heart’s content. They each picked a kitty and decorated that too. The best thing about these kittens is that they are washable so you can change the way they look as much as you like – it is nice when something like this can be reused over & over again, as it increases the play value. Overall both the girls and I were pleased with this toy. I love the fact that it tidies away neatly and is great for taking with you for entertainment on the go. 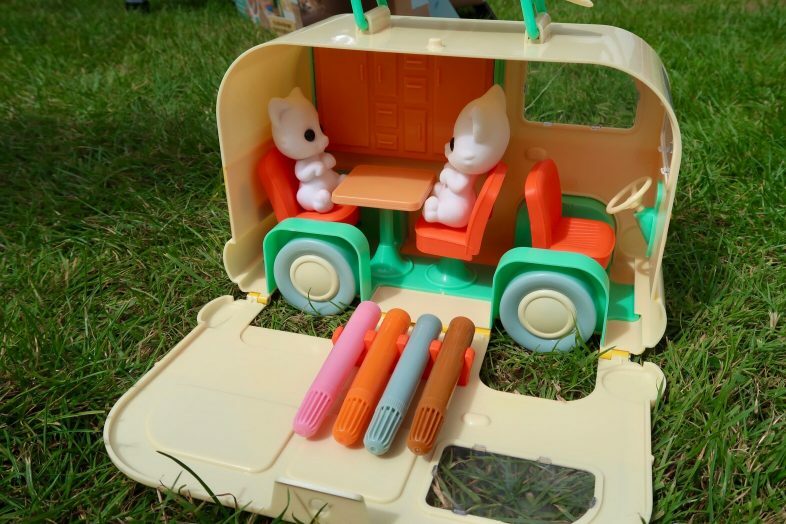 Once they had finished decorating everything, both girls really enjoyed playing make believe games with the van & kitties. 5 stars for this fun toy.